Recently, we wrote about giving it away – the idea of giving would-be customers a chance to experience your brand and your value for free. Many small businesses, particularly consultants and professional service providers, achieve this through sharing of proprietary content – eg whitepapers, tip sheets or toolkits – via their websites. Which begs the question – to gate or not to gate? Many small business owners struggle with how much to give away without capturing some level of information about the interested reader. After all, how can a small business fill the lead pipeline or grow its email marketing list without requiring downloaders to provide at least their name and email address? We’d argue that good content drives both metrics. However, as with all of our advice, the answer to what to gate depends on the content, your business, your technology and your target market. How many downloads? Are you offering more than one piece of premium (free, yet restricted access) content? Consider the annoyance factor to would-be customers by requiring them to re-enter their information each time they want to download a different resource. While it can be interesting to know who is downloading what, does that level of detail provide you with sufficient value to compensate for the frustration is causes site visitors? Do you even use the data in sales follow-ups or map it to prospects’ profiles in your CRM system? If not, consider more of a single sign-on approach. Provide real value. Time and again we see small businesses offering “top 10 tips for…” as incentives for folks to sign up for a mailing list. While we agree there can be value here in terms of driving registrants to add to a drip marketing list, the quality in the top 10 list must be there. All too often these downloads are little more than fluff that leave registrants disappointed from the outset. When crafting these incentives, make sure they’re valuable and truly offer a resource unavailable through your blog or other non-gated channels. Just give them what they asked for! If you choose to gate content, once a site visitor provides their information, give them the file they requested. Sounds simple, but time and again we see small businesses capturing the lead, sending an email to the customer with a link, then redirecting them back to the website where they still need to download a file. Not nice! If your technology requires the email approach, include the requested file in the email or make content readily available via a link. The more actions a downloader is required to take, the less likely they are to make it through the process. Then, while you’ve captured the lead, you’ve failed to provide the promised value. Transparency and follow up. 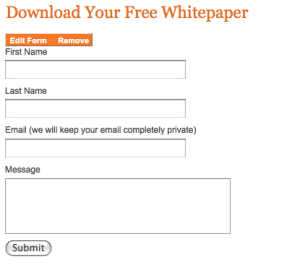 If gating content, be sure that the download form clearly explains that by providing information, they are consenting to being added to your email list. Another seemingly obvious tip – add folks to your list! If your technology platform doesn’t automatically add registrants to your email list, be sure to import any new names before your next campaign. And follow up! When appropriate and in keeping with your sales strategy, call, email, or send direct mail to new prospects expressing interest in your offerings.